Ever since hearing about the Tether Tug, I’ve always wanted to try it out with Sadie. But my pup is so picky that I wasn’t sure it would be useful in my household. 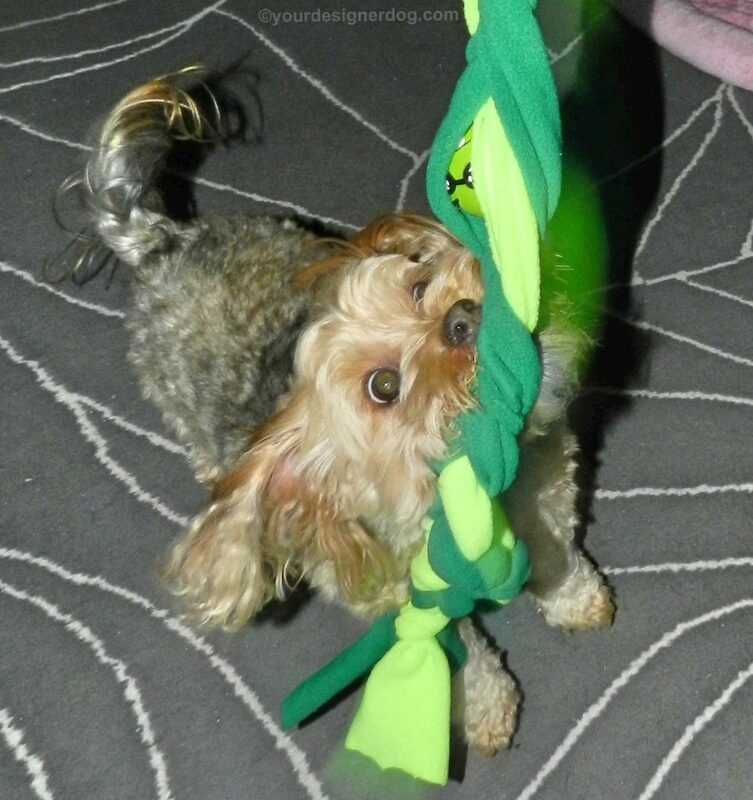 When the opportunity came to test the Tether Tug for a product review, Sadie and I jumped at the chance. And it couldn’t have come at a more perfect time, as I’ll explain later. 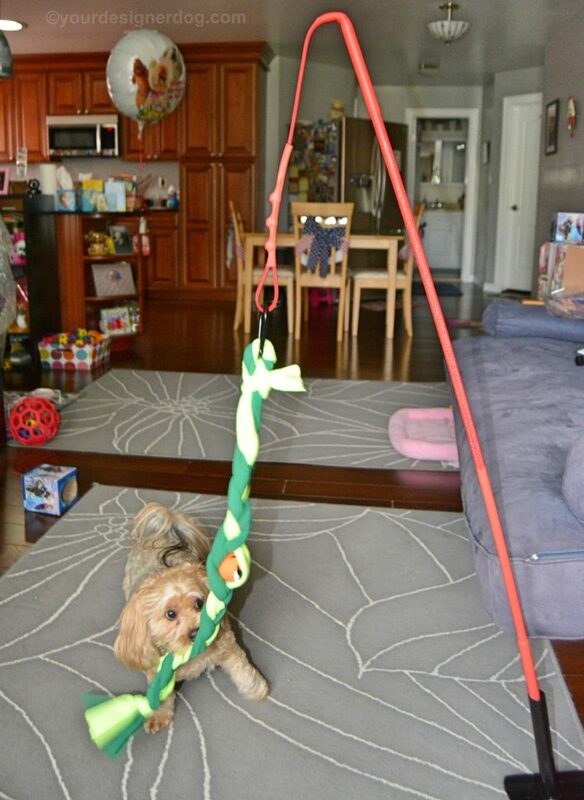 In case you’re not familiar, the Tether Tug is an interactive toy for dogs. 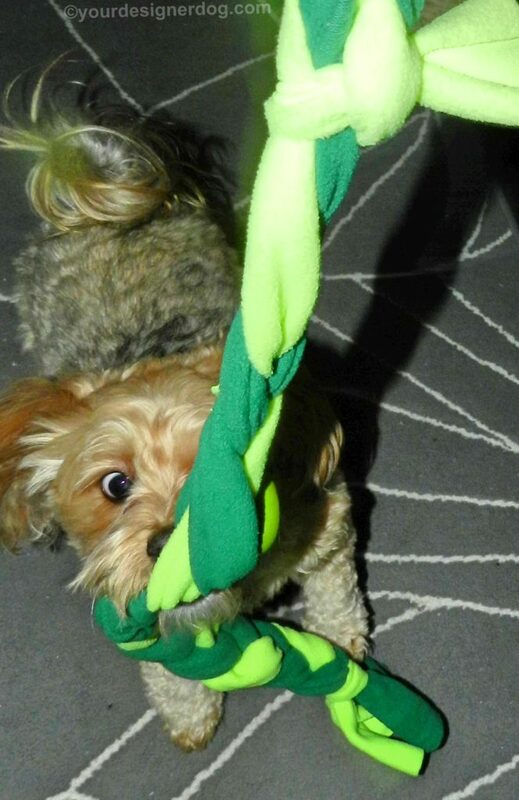 It’s a really simple concept – a rope toy attached to a pole. 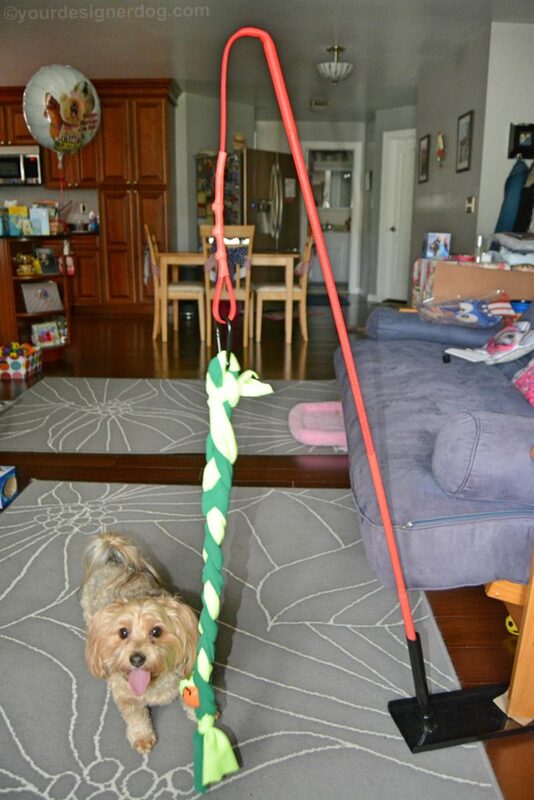 But the pole has a flexible portion that allows your dog to move that rope around and tug on it. The rope is attached via a carabiner so that it can be taken on and off and replaced if necessary. There are both indoor and outdoor Tether Tugs, as well as different models depending on the size of your dog. The outdoor models involve securing the pole in the ground and then allowing your dog to have endless amounts of fun tugging at the rope. It kind of reminds me of a doggie version of Tether Ball. The indoor version, which Sadie and I tested out, involves securing the pole into a holder, which is held in place by the foot of any heavy piece of furniture. 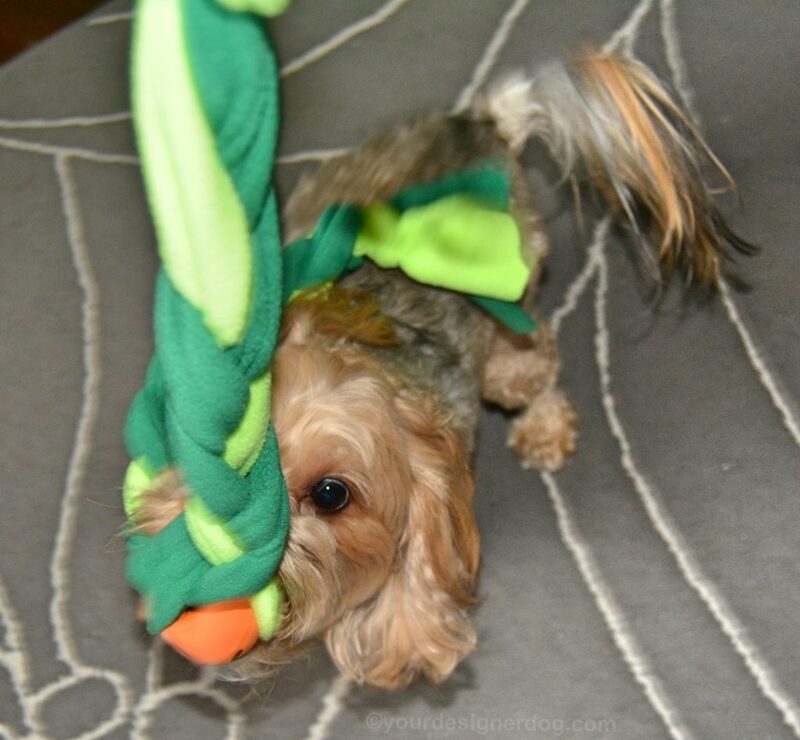 The rope of the indoor Tether Tug is made of a soft fleece material that seems very sturdy, but won’t irritate a dog’s mouth or damage any furniture it comes into contact with. As you can see in my photos, I have Sadie’s Tether Tug held in place by the foot of our couch. As I suspected, Sadie wasn’t too excited with this toy at first. She’s not much of a tugger and doesn’t usually grab onto anything, even if I try tempting her. But I quickly realized that if could involve one of her squeaky balls with the Tether Tug, then Sadie would be much more interested. So I took a squeaky ball and secured it in between the braids of the fleece rope. As soon as I let go, Sadie began jumping and tugging and having a good time trying to free her squeaky ball from the Tether Tug. As I mentioned earlier, Sadie’s Tether Tug arrived at the perfect moment – just as I suddenly came down with the flu. All I wanted to do was sleep all day and I barely had enough energy to switch from the bed to the couch. Sadie was more than happy to sleep alongside me most of the day, but eventually she grew bored and wanted something to play with. That’s when the Tether Tug came in to save the day. I set it up, hid her squeaky ball in the rope, and watched from the couch as Sadie pulled and tugged and jumped and barked and wore herself out with her new toy. From this experience I have realized that the Tether Tug would be an invaluable tool for any dog owner with mobility issues or disabilities. 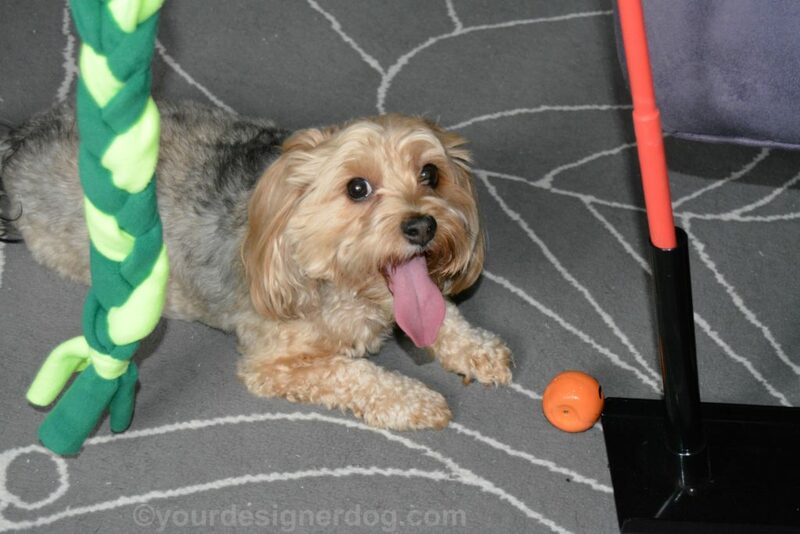 Your dog will have a fun way of releasing all his or her pent up energy without needing human involvement. Visit TetherTug.com to learn more and get one for your own dog. Prices range from $49.99 to $64.99 for the complete toy, and you can also buy separate/replacement ropes and tethers for your dog to enjoy. This post is part of the Thoughtless Thursday blog hop hosted by Ruckus the Eskie, Love Is Being Owned By a Husky, and M.K. Clinton. I received a sample product to test out in exchange for an honest review. All opinions are my own, based on my personal experience with the product. I’ve never seen that before, how cool! My sister’s dog would love that! Tether Tug is nice dog toy for retractable tensile. Cool! At first I thought this would be a perfect toy for my sister’s dog, a boxer. But he’d keep pulling till the whole thing came down! I don’t think my sister or her husband would appreciate that.